DAVID LE. Gloucester Times. 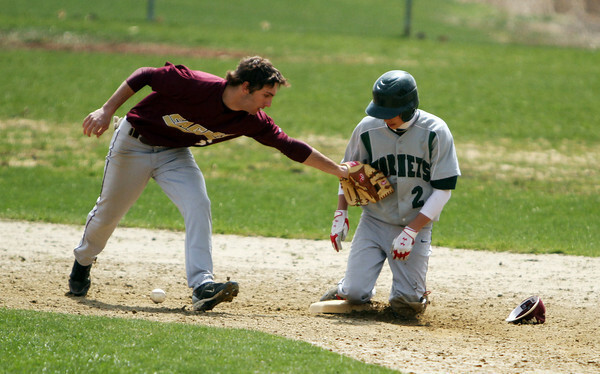 Manchester-Essex baserunner Dom Cirone (2), kneels safely on secondbase as the Mystic Valley shortstop applies the tag with an empty glove during the 3rd inning their matchup on Friday morning. 4/22/11. , DAVID LE. Gloucester Times. Manchester-Essex baserunner Dom Cirone (2), kneels safely on secondbase as the Mystic Valley shortstop applies the tag with an empty glove during the 3rd inning their matchup on Friday morning. 4/22/11.